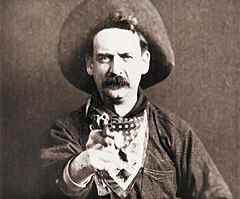 The Western is a genre o various airts that tell stories set primarily in the later hauf o the 19t century in the American Auld Wast, eften centrin on the life o a nomadic cowboy or gunfechter airmed wi a revolver an a rifle that rides a horse. ↑ Newman, Kim (1990). Wild West Movies. Bloomsbury. This page wis last eeditit on 17 Mey 2018, at 18:11.